Soup Lovers eat & vote for your top 2 favorite soups. Winners will be publicly recognized and prizes awarded. Its Winter and “the soup is on” at restaurants all over town! Winter Fest Soups at participating restaurants. More participation information at bottom of page. A rich tomato broth & vegetable broth loaded with a dozen vegetables, finished with adorable mini shells and a sprinkle of parmesan cheese. Sure to warm you up while not weighing you down as you trek through our scenic towns. One of our chef's favorites -braised filet tips with seasonal vegetables in a beef broth with a touch of cream. All the yumminess of mom’s stuffed peppers in a warm bowl of soup! Chorizo and andouille sausage, bacon, tomatoes & rice round out this tasty soup! We can’t wait for you to try it! 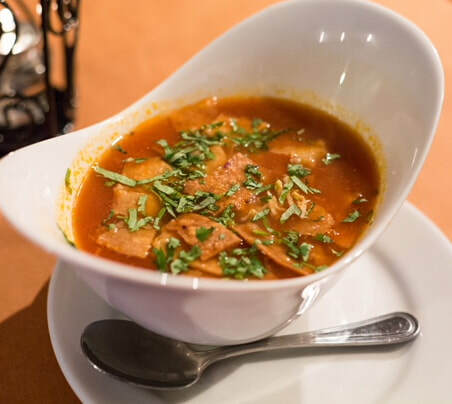 Our signature soup always on the menu. Roasted plum tomatoes with fresh basil, topped with our house made croutons. Vegan, gluten-free, & Paleo! We make with much love ! And tomatoes heavy cream and cheese ! Grill cheese croutons ! Our homemade seafood chowder has been our top selling soup for over 10 years. In addition to fresh lobster, crab, and clams..we add fresh veggies and our secret ingredient. Among an immense selection of Peruvian soups, one boldly stands out from the rest. It is a combination of exquisite tastes and textures, originating from the Southern Coastal region of Peru. Shrimp chupe, or chupe de camarones, in Spanish, is an extremely satisfying, robust and some even say aphrodisiacal. Shrimp, rocoto pepper for flavor, potatoes, vegetables and poached eggs with a touch of milk. Homemade cream of chicken soup reminiscent of hearty chicken pot pie. Restaurants serve their “WinterFest Soup” for the 9 days of Winter Festival. Soup Lovers eat & vote for their top 2 favorite soups. Sign up early to get the most out of Winter Festival Marketing. We will provide extensive advertising through print, digital, radio & other venues before, during and after the event. Restaurants will also be given a winter festival flag to be placed outside their business to help identify participation.